You can trust Alpha Chemical for the most effective and expertly formulated automotive cleaning solutions and commercial car wash products available on the market. We offer an extensive selection of soaps, protectants, cleaners and more for a wide range of applications in the automotive manufacturing, washing, and maintenance industries. At Alpha Chemical, we work to provide the automotive companies we serve with the most effective car cleaning products available on the market. Our extensive variety of advanced formulations offer the selection your require, and the results you can rely on for customer satisfaction. Choose from our car wash prep soaps, car body soaps, carpet and interior cleaners, drying agents, floor cleaners, foaming polishes, fragrances and odor eliminators, hand soaps, interior and exterior dressings, protectants, towel soaps, wheel cleaners, tire shine, and more! 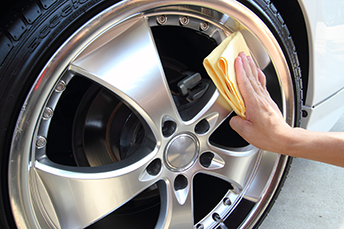 If you don’t see the exact product you’re looking for, simply contact us and we will be happy to discuss our custom solutions and work with you to develop an automotive cleaning solution that meets your needs. Heavy-duty powdered towel and uniform detergent. Excellent grease cutting formulation will dissolve freely and takes out grease, dirt and stains and leaves towels extremely clean and fresh. Extends your towel life and is an exceptional value. Dilutions up to 1/4 LB per gallon of water.